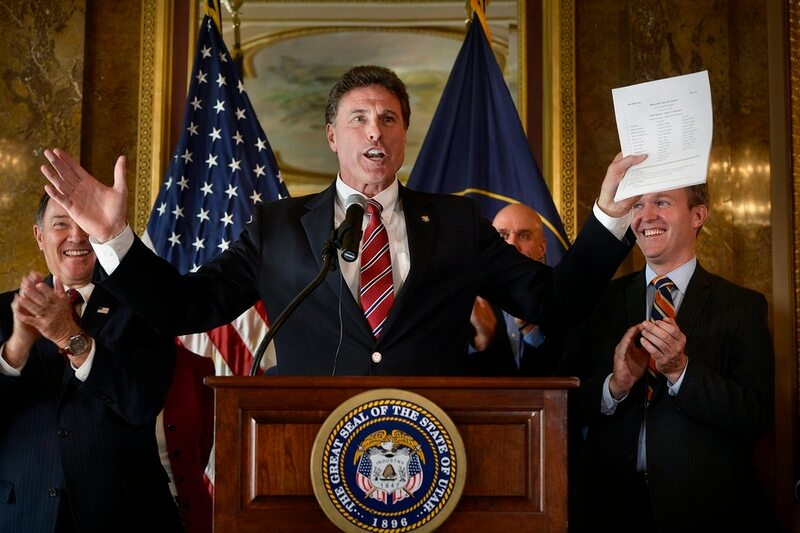 (Scott Sommerdorf | The Salt Lake Tribune) Representative Jim Dunnigan, R-Taylorsville, lets loose with an exuberant bit of celebration from the podium as he discusses his long efforts to get this Medicaid expansion done in Utah. Utah Governor Gary Herbert reacts at left, along with Salt Lake County Mayor Ben McAdams at right, Wednesday, November 1, 2017. (Scott Sommerdorf | The Salt Lake Tribune) Utah Governor Gary Herbert gets a round of applauds at center as Salt Lake County Mayor Ben McAdams speaks from the podium after the Governor announced a plan that expands Medicare coverage in Utah, Wednesday, November 1, 2017. 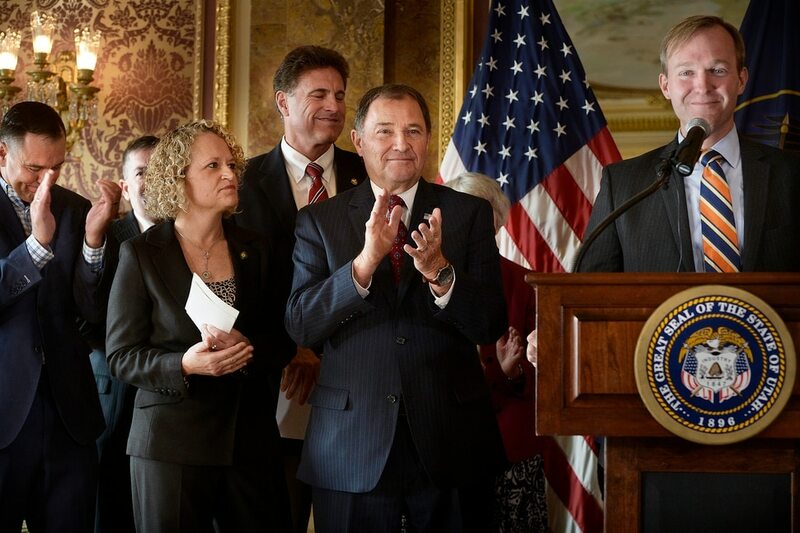 From left to right; House Speaker Greg Hughes, R-Draper Salt Lake Mayor Jackie Biskupski Representative Jim Dunnigan, R-Taylorsville, Utah Governor Gary Herbert, and McAdams. 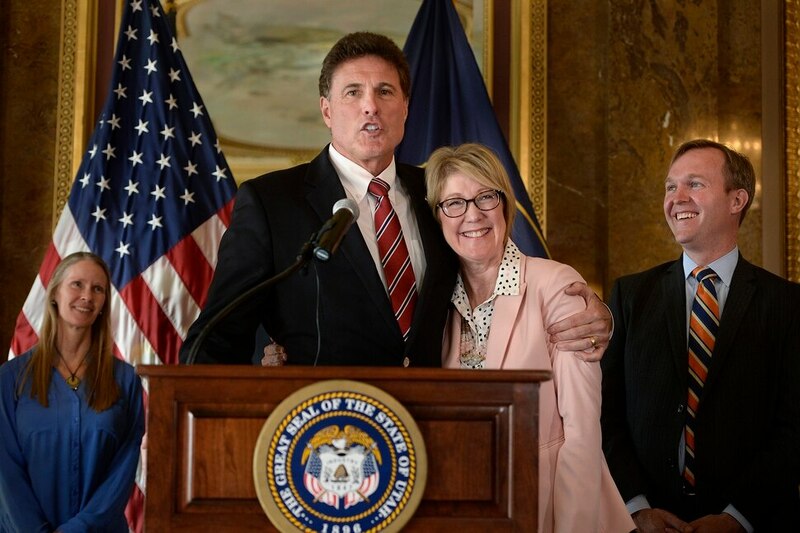 (Scott Sommerdorf | The Salt Lake Tribune) Representative Jim Dunnigan, R-Taylorsville hugs drafting attorney Cathy DuPont after he spoke about her important role in getting the Medicaid expansion effort done. Utah Governor Gary Herbert announced the successful expansion, Wednesday, November 1, 2017. (Scott Sommerdorf | The Salt Lake Tribune) Utah Governor Gary Herbert gets a round of applause as he announced a plan that expands Medicare coverage in Utah, Wednesday, November 1, 2017. Front row, from left to right; Salt Lake Mayor Jackie Biskupski House Speaker Greg Hughes, R-Draper Utah Governor Gary Herbert Salt Lake County Mayor Ben McAdams (Scott Sommerdorf | The Salt Lake Tribune) Salt Lake Mayor Jackie Biskupski speaks about how helpful the Medicaid expansion announced by Utah Governor Gary Herbert will be to the efforts in the the Rio Grande neighborhood, Wednesday, November 1, 2017. (Scott Sommerdorf | The Salt Lake Tribune) Tim Whalen of Salt Lake County speaks about the Medicaid expansion announced by Utah Governor Gary Herbert, Wednesday, November 1, 2017. (Scott Sommerdorf | The Salt Lake Tribune) Utah Lt. Governor Spencer Cox introduces Utah Governor Gary Herbert who announced plans for an expansion of Medicaid in Utah from the Capitol's Gold Room, Wednesday, November 1, 2017. (Scott Sommerdorf | The Salt Lake Tribune) Utah Governor Gary Herbert, left, listens as House Speaker Greg Hughes, R-Draper, speaks about the successful expansion of the Medicare program in Utah, Wednesday, November 1, 2017. (Scott Sommerdorf | The Salt Lake Tribune) Salt Lake Mayor Jackie Biskupski speaks about how helpful the Medicaid expansion announced by Utah Governor Gary Herbert will be to the efforts in the the Rio Grande neighborhood, Wednesday, November 1, 2017. (Scott Sommerdorf | The Salt Lake Tribune) Lt. Governor Spencer Cox speaks about the Medicaid expansion announced by Utah Governor Gary Herbert, Wednesday, November 1, 2017. (Scott Sommerdorf | The Salt Lake Tribune) Utah Governor Gary Herbert announces a plan that expands Medicare coverage in Utah, Wednesday, November 1, 2017. Front row, from left to right; Salt Lake Mayor Jackie Biskupski House Speaker Greg Hughes, R-Draper Utah Governor Gary Herbert Tim Whalen / Salt lake County Salt Lake County Mayor Ben McAdams (Scott Sommerdorf | The Salt Lake Tribune) Nathan Checketts of the Utah Department of Health speaks about the Medicaid expansion announced by Utah Governor Gary Herbert, Wednesday, November 1, 2017. (Scott Sommerdorf | The Salt Lake Tribune) Representative Jim Dunnigan, R-Taylorsville, lifts up a copy of his bill HB 437 from the 2016 legislative session as he discusses the early efforts that culminated today in the announcement by the Governor of Medicaid expansion in Utah, Wednesday, November 1, 2017. (Scott Sommerdorf | The Salt Lake Tribune) Utah Governor Gary Herbert, left, listens as House Speaker Greg Hughes, R-Draper, speaks about the successful expansion of the Medicare program in Utah, Wednesday, November 1, 2017. (Scott Sommerdorf | The Salt Lake Tribune) Salt Lake County Mayor Ben McAdams beams from the podium as he speaks about the successful Medicaid expansion in Utah announced by Utah Governor Gary Herbert Wednesday, November 1, 2017. The federal Health and Human Services Department has approved Utah’s long-requested Medicaid waiver — a plan that will provide health coverage for about 6,000 poor adults without children. The waiver and accompanying federal funding are critical parts of Operation Rio Grande, the effort attempting to crack down on lawlessness in downtown Salt Lake City and provide services — including mental health care and drug-addiction treatment — to homeless Utahns. Gov. Gary Herbert and more than a dozen other state and local officials gathered Wednesday at the state Capitol to announce the agreement, which officials said wasn’t finalized by the feds until minutes earlier. Herbert said the waiver would “help those people who really are our most vulnerable populations” — especially the homeless, who often face drug addiction and mental health issues. The Utah Department of Health first submitted the waiver to the Centers for Medicare and Medicaid Services in July 2016, with hopes of enrolling individuals Jan. 1, 2017. But nothing much happened; federal approval never came. In August, state officials sent the feds another, modified waiver proposal. It added work requirements and other restrictions on eligible months of coverage — amendments that had been nonstarters under President Barack Obama’s administration. Some Utah health advocacy groups are critical of the amendments, saying they amount to unnecessary hurdles for the poor to obtain coverage. The state will begin enrolling Utahns newly eligible for Medicaid immediately. To be eligible, residents must earn no more than 5 percent of the federal poverty level and must be deemed “chronically” homeless or be in the criminal justice system. The expansion includes roughly $70 million annually in federal funding and $30 million from state sources, including hospitals. Officials said they will enroll eligible Utahns as they apply. But they acknowledged they will likely reach their funding limits and be forced to close enrollment before all eligible candidates get coverage. A focus of Operation Rio Grande is adding more drug treatment beds for those arrested in the clampdown, including a large number addicted to opioids. About $10 million per year from the waiver funds will allow the state to add roughly 180 beds over the next year, officials said. Representatives of some of those drug abuse recovery centers were in attendance Wednesday, including Odyssey House and First Step House. In addition, Stevenson said, the expansion is only “temporary help” for those who will be covered. They must be homeless or in the criminal justice system in order to receive Medicaid assistance under the deal. “But as soon as they don‘t qualify under those categories, [these recipients] lose their coverage.” This is a disincentive for people to recover from addiction and find a job, if they know they will subsequently lose coverage, he said. Other health care advocates hope the state’s previously proposed amendments are not added to the agreement. They include a 60-month lifetime limit on coverage under Medicaid, and a work requirement to get covered — stipulations that Jessie Mandle, a health policy analyst with Voices for Utah Children, said would simply make it harder for needy people to get care and drug treatment. Wednesday’s announcement was mostly a Republican affair, but Salt Lake City Mayor Jackie Biskupski and Salt Lake County Mayor Ben McAdams, the state’s two most prominent Democrats, also were there. Both have been big proponents of Operation Rio Grande. McAdams said the waiver deal wasn’t perfect, but he backed it because it was the one proposal that “was able to garner enough support to move forward in Utah.” Full Medicaid expansion under the Affordable Care Act — which would give health care to approximately 100,000 low-income Utahns — has never gained enough traction in the Republican-controlled Legislature. However, a proposed 2018 Medicaid expansion ballot initiative by the organization Utah Decides Healthcare is moving ahead. The initiative would bypass the Legislature, making expanded coverage law if it makes it on the ballot and passes a year from now. Utah Decides Healthcare began holding its required public hearings on Wednesday, the first step they must complete. Next, they must collect more than 113,000 signatures before the April 15 deadline. At a Salt Lake City hearing Wednesday, the campaign’s director, RyLee Curtis, explained to about 10 people in attendance how the proposed expansion covers single adults making under $16,000 annually, and families of four earning less than $33,000. Expansion would bring about $700 million in federal funds annually to Utah, with another $91 million covered by the state. Under the initiative, the state would pay for its share by upping the statewide sales tax rate from 4.7 percent to 4.85 percent. On Wednesday, officials at the Capitol said they were pleased to secure even a small slice of health coverage for Utah’s poor. “Today is an answer to the prayers of families and loved ones of the people who are in crisis right now,” McAdams said of the waiver‘s approval.